Cased in yellow gold, this reference 6542 is an extremely compelling example. It most notably displays a dark burgundy dial with an additional luminous dot at 6 o'clock known as an "exclamation" mark. Scholars hypothesize that this signifies a lower radium reading. Closer examination of this timepiece reveals a bezel that does not show any signs of radium. 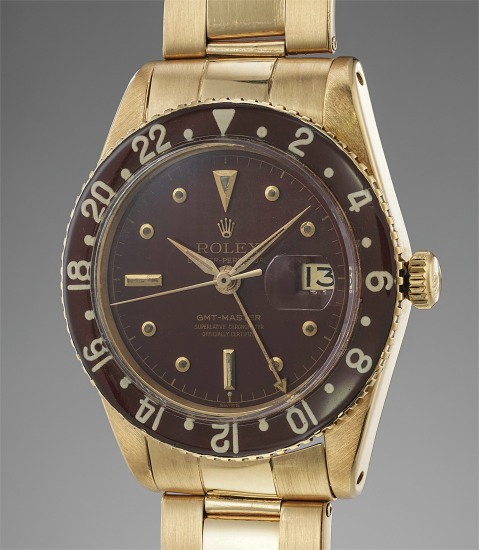 One can thus come to the conclusion that the watch went back to the Rolex workshops in the early 1960s, where the bezel and dial were upgraded to comply with the then health standards. The case is preserved in spectacular condition, with sharp finishes on the top of the lugs. The bevels are present, and there is barely any surface wear throughout the watch. The end links are stamped 80, which is correct for this timepiece. The clasp is stamped for the third quarter of 1959, which corresponds with the year of manufacture. This timepiece has most notably appeared on the market twice, both times soaring past its low estimate with a final price of 159,000CHF in 2010, and 197,000CHF in 2013 - both very high prices for the era, attesting to the market's support and recognition of this watch's quality.